Your stay begins in our Professionally Decorated and Designed Home with your very own heated pool in an enclosed lanai. Our home is located in a very nice private very safe neighborhood. The rear of Property is fenced on all four sides to make your time spent in your vacation home very private. Making your time spent around the pool that much more enjoyable. Spend your time relaxing in the enclosed lanai in the heated pool with all the amenities you desire. Your Vacation Home is completely equipped with everything you need. Gorgeous contemporary kitchen has it all, Side by Side Refrigerator with built in ice maker, Dishwasher, Slide in Range/Oven, Space Saver Microwave, Toaster, Coffee Maker. All your cooking implements including pots, pans plus plates, bowls, silverware, drinking glasses, coffee cups its all here for you. Dining table and peninsula bar for added seating. Its all here ready to serve you. Outdoor Pool Side Lounge Chairs to relax by the pool, floating lounge chairs, Outdoor Dinette, Outdoor Patio Seating with tables for maximum relaxing. Outdoor settee for those private moments by the pool. Completely screened in Florida Room is great for relaxing out of the Sun but with the feel of being outside. Close it up or open the entire room to the outside and inside. The Florida Room is also great as the third bedroom making the perfect dual use room. It can be completely private from the rest of the home.. With Blinds on all Glass and Locks on all Doors it is as private as any of the Bedrooms. Florida Room is Equipped with a very comfortable Sofa sleeper that converts easily to a Queen size Bed Equipped with all bedding and pillows and Linens. Florida Room has a dresser for the storage of your personal Items. There is also a LCD TV in the Florida room connected to a DVD player Second Bedroom is fully equipped with all the amenities you need to make your stay as comfortable as can be. Second Bedroom has a Queen size Bed and a very large double wide closet. LCD TV in the 2nd bedroom connected to cable. All Bedding and linens are provided. The Living Room and Master Bedroom each have LCD TVS connected to cable. There is FREE WiFi throughout the entire property. Master Bedroom has an on suite with dual sinks and plenty of storage for all your personal items for complete privacy and convenience with a Gorgeous King size bed with an incredibly comfortable Double Pillow top Mattress. Note that our calendar and our rates are always up to date so you can rely on the prices and dates you see available. Ask for Special Discounted rates for Extended stays. 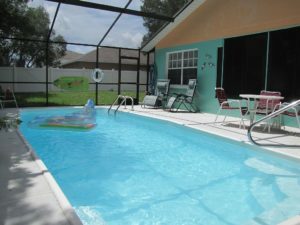 Close to Tampa, Disney, Universal and Sea World, Busch Gardens, Clearwater , St Pete Beach. Come enjoy all of Florida right out your door. Everything is within an easy drive. Tampa airport is only a 35 minute easy drive. Gulf Coast with beautiful White sand beaches only a 15 minute drive. Weeki Wachee Springs and the Weeki Wachee River is just minutes away. Absolutely gorgeous trip. Take a canoe or kayak float trip with your family or loved ones with Paddle Boat adventures. An absolute do not miss fun day on the Weeki Wachee River leaving from Weeki Wachee State Park and Paddle Boat adventures.